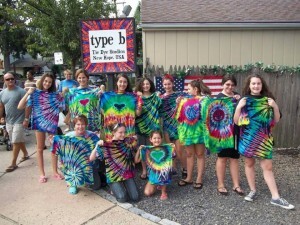 Have a tie dye party at type b. 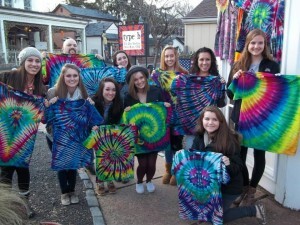 No tie dye experience needed to make fantastic tie dye. Fun for the whole family. 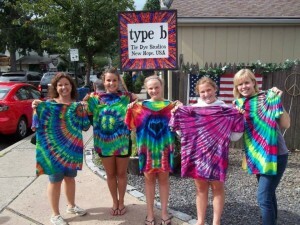 If you are looking for something different for your next party, have a Tie Dye Party at Type B Studios. FUN to make and FUN to wear. How much time will it take? 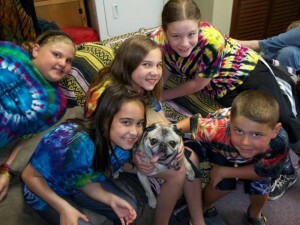 It takes approximately 10 minutes per person to tie dye and then 2 hours for the wash & dry. Use that time to enjoy the wonderful town of New Hope. 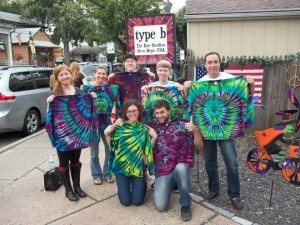 There are many things to do in New Hope PA and good places to eat as you enjoy your friends and family. How much will it cost? 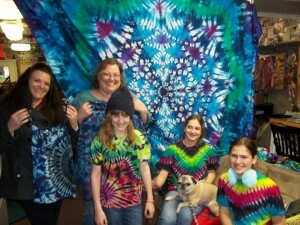 We charge based on size and type of clothing you want to tie dye. Prices start at $20 per T-Shirt. We accept MasterCard, VISA, AMEX and Discover. 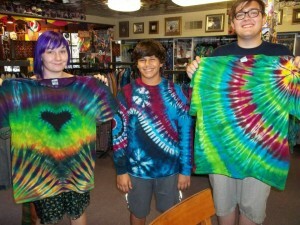 What type of clothing is available to tie dye? We always have in stock Long and Short Sleeve Tee-Shirts. Girl tank tops and V-neck Tees are also frequently available. 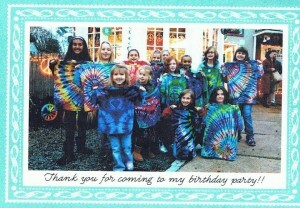 If you wish to dye a dress or another item please inform us when you schedule your party. Also if you want a specific design, please inform us when you schedule your party. Long and Short Sleeve Tee shirt sizes available in Youth Extra Small all the way up to Adult 5xl. We can not guarantee we will have every type of clothing in every size and style available to you when you walk-in, so we recommend you call and schedule a party at least two weeks in advance. 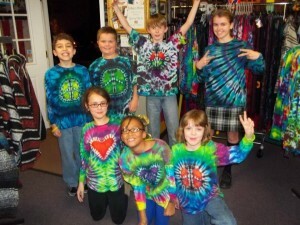 May I bring my own clothing to tie dye for the party? Not the same day of the party, sorry. 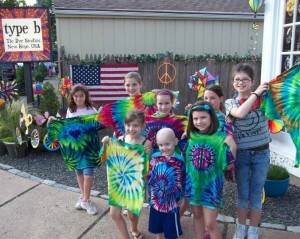 If you are interested in tie dyeing your own items, please bring them to us, to prepare, when scheduling your party date and time. We ask that you give us at least one week notice for this. Also please make sure your items are white or pale in color and 100% cotton. 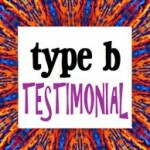 If you want to do team tee shirts or t-shirts with writing, we suggest you have the writing printed on the tee in white so that it stands out against the tie dye background. What do I need to bring to the party? Not a thing. We have all the stuff here at our studio including all colors of dye, gloves and aprons. Just show up with your family and friends and chill. Try your hand at a unique party gathering. 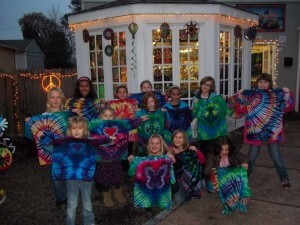 Hosting a tie-dye party is a groovy way to get your friends and family together to experiment in the art and joy of tie dyeing. We handle all the mess and hard work, you have all the Fun! FUN to make and FUN to wear!! 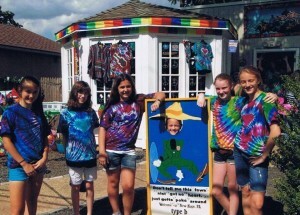 Call us at 215-693-1446 to arrange a most memorable birthday party.